Prince, aka AZ Prince Red, is a three-year-old light brindle male born May 29, 1999. He should be called Prince, aka Mr. 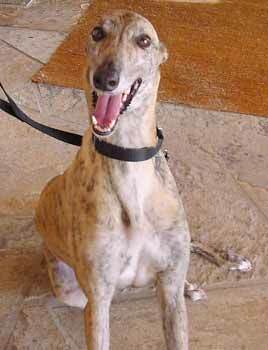 Personality, as he is very, very affectionate - a real people-oriented greyhound - always smiling, friendly and that tail never stops! Prince has been receiving obedience training and now has learned to sit, stay, roll-over and heel very well. 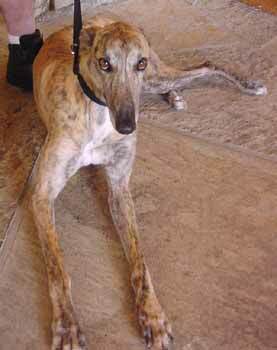 Prince's racing career at Gulf Greyhound Park was cut short when he broke a leg, which is all healed now and doesn't prevent him from being a wonderful companion pet. His tail has also been docked as it was damaged from the starting box. He loves the one-on-one human attention and only wants to please his companion. Prince needs to be in a home where he is the only pet.